So you like it more than hot? You want the heat of the sun to enter the sanctuary of your vegetable plate? You like it hotter than magma? Meet miss ghost pepper and her fiery friends. She’s not hot, she’s incinerating. Just the way you like it. Peppers are the belles of the ball at any buffet table. Pure veggie eye candies, these ladies in their bright colored dresses are an easy sell. Some of these ladies are hotter than then the others though, and some are almost too hot to handle. Like lovely little Miss Ghost Pepper. Peppers, whether sweet or hot, are members of the plant genus capsicum. A term that derives from the Greek word kapto, which means ‘to gulp’. They are members of the nightshade family, which also includes potatoes, tomatoes and eggplant. They are not related to that other pepper, Piper nigrum, you grind on your food. When Columbus tasted the small, hot red “berries” he found on his Caribbean voyages, he believed he had reached India where Europeans obtained black pepper and called them red pepper. He was a bit off the mark as the world soon figured out, but the names had stuck even though the native peoples of the Americas had been growing and enjoying sweet and hot peppers for an estimated 7,000 years. When Columbus’s ships brought them back to Spain, traders spread them around the world and the pepper became an instant hit everywhere. She showed up in kitchens, wrapping cuisines around her delicious little finger from Morocco to Hungary, and India to China. In some places people liked their food hotter than elsewhere. Since the pepper is easy to grow and to cross breed, many varieties of these ladies popped up around the world with the ghost pepper being currently one of the hottest varieties on this little blue planet. 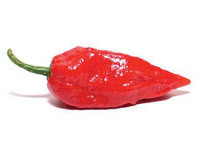 In fact, from 2007 until 2010 Guinness World Records stated that the ghost pepper was the hottest. 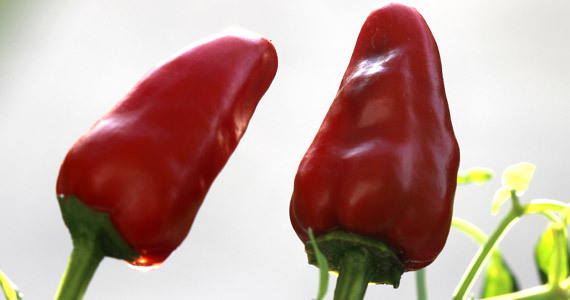 The orange and red little lady rated over 1 million Scoville heat units, a range that identifies how spicy a pepper is. In comparison: that is four hundred (400!) times hotter than Tabasco. Eating a ghost pepper is tricky because when you first put it in your mouth, it has a sweet flavor. However, about 45 seconds after putting in your mouth, the fiery sensation starts and continues to intensify for a further 10 to 15 minutes. At the very least, you’ll experience a painful, stinging sensation on your tongue when you eat a ghost pepper. Your lips, gums and inside of your mouth will likely sting quite painfully as well. Eating just a small piece can also make your eyes water. Your upper body might break into a sweat and your heart might beat faster when you eat a ghost pepper. The heat begins to cool down about half an hour after starting to eat. Digonta Saikia, an Indian farmer who grows ghost peppers, told NBC News that eating one of these peppers is ‘like dying’ because they are so intensely spicy. Great fun, right? Yeah, you know you want them. So, I’ve got you thinking about growing them yourself? Let me add a little more spice to this plant. Peppers are very healthy. When ripe (and thus red) they contain more vitamin C then citrus fruits, massive amounts of vitamin E and a lot of Carotene. The stuff that makes ghost pepper hot is called capsaicin: the hotter the pepper, the more capsaicin. This phytochemical exists, most likely, to deter animals from eating peppers. It is also the active component of pepper sprays used for self-defense. Yet for humans it offers a myriad of health benefits. If you don’t rub it in your eye, that is. A study published in Cancer Research found that capsaicin caused cancer cells to commit suicide. The substance caused almost 80% of prostate cancer cells to die in mice and prostate tumors treated with capsaicin were about one-fifth the size of those in untreated mice. Capsaicin is also known as a painkiller. Studies have found that capsaicin both relieves and prevents cluster headaches, migraine headaches and sinus headaches. Capsaicin also has potent antibacterial properties that fight and prevent sinus infections, or sinusitis. As it is so hot, it also helps to stimulate secretions that help clear mucus from your nose, thereby relieving nasal congestion. This phytochemical may also help relieve sinus related allergy symptoms. Capsaicin is also a potent anti-inflammatory agent. It is being looked at as a potential treatment for arthritis, psoriasis and diabetic neuropathy. A Duke University study (US) found that capsaicin might lead to a cure for inflammatory bowel disease (IBD). The substance can also help to kill bacteria such as H. pylori, which can help prevent stomach ulcers. Last but not least capsaicin may help to protect the heart by reducing cholesterol, triglycerides and platelet aggregation. It may also help the body dissolve fibrin, which is necessary for blood clots to form. Furthermore, cultures around the world that use hot peppers liberally in their meals have significantly lower rates of heart attack and stroke than cultures that do not. The list of health benefits doesn’t stop there. It also helps in losing weight. Capsaicin increases metabolic activity. This, in turn, helps to burn calories and fat. You like it a bit less chili and bit more chill? Well, about 80% of the capsaicin in a chili pepper is in its ribs and seeds, which is why much of the heat is removed when these items are taken out. The fun thing about growing rare species like ghost pepper is that they are very hard to come by, since almost no grocery store sells them. So, order your seeds online. 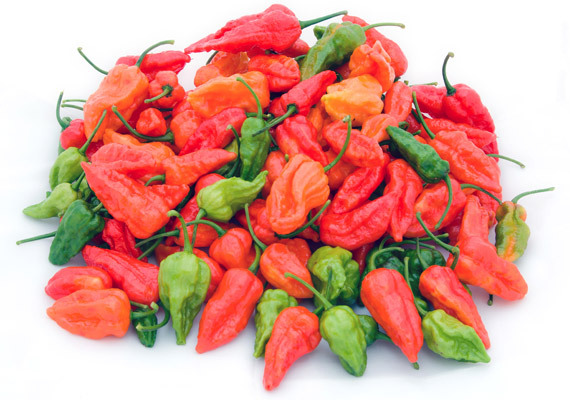 Growing ghost peppers is difficult compared to other peppers due to their requirements for a certain amount of humidity and heat, which is in direct relation to their heat index. In order to optimally grow these peppers your climate should most closely match that of their native India, which has five months of intensely high humidity and temperatures. If your growing season is short, the ghost pepper plants can be moved indoors in the evening. However, these plants are sensitive to shifts in their environments and a lot of moving around may damage the plants irreparably. The surest way of growing ghost peppers is indoors or in a greenhouse where temperatures can be maintained at 75F. Seeds for ghost peppers take around 35 days to germinate in very warm soil between 80-90F while keeping the soil consistently moist. Use full sun fluorescent light bulbs to maintain temperature and humidity. 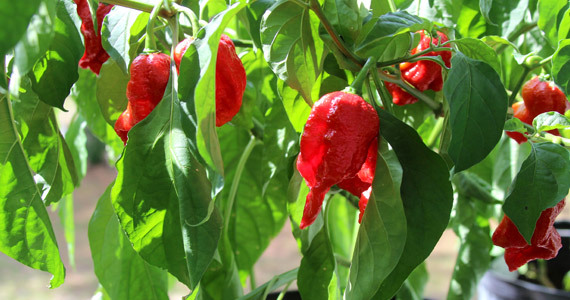 Fertilize the newly planted ghost pepper plants and then two or three more times during the growing season. Alternatively, use a controlled release fertilizer to feed during the whole growing season. Lastly in the care of ghost chili peppers, maintain a regular watering regime to avoid shocking the delicate peppers. As difficult as it might be for you, pinch off any early blossoms that appear on your pepper plants. This won’t harm the plants. In fact it helps them direct their energy into growing, so you get lots of large fruits later in the season (and a higher overall yield) instead of just a few small fruits early on. You can harvest the peppers at their immature green stage, but the heat will grow more intense if you wait for them to turn their mature color orange or red. To be on the safe side when harvesting ghost peppers, you might want to wear gloves to prevent any burns from the peppers. You can save them for a long time if stored in your freezer. 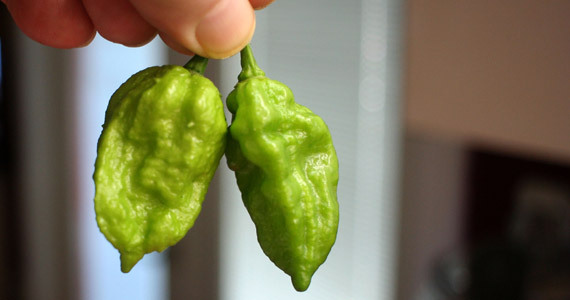 Big fat warning: when you’re handling ghost peppers wear gloves to protect your hands and be careful not to touch your face or eyes. Wash your hands frequently and thoroughly, and clean your cooking equipment carefully. If you’re grinding the peppers in a food processor or blender be careful to avoid inhaling any dust that may arise. It may be a good idea to wear goggles. Ready? Hit it, ghost pepper! This recipe will give you the most out of the taste of Miss Ghost pepper. It will also preserve her. The salt absorbs all of the heat from the peppers. This is especially fantastic because the salt will dissolve into whatever you cook and spread the heat through the dish without dramatically changing the flavor. 2 cups of ghost peppers or 1-cup ghost pepper puree. 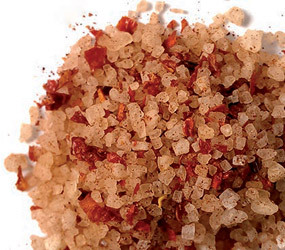 2 cups of sea salt. Rinse peppers and remove stems. Place peppers in blender and blend until fine. In a clean jar, mix the peppers and salt. Shake. Over the next few days, shake once per day (it’s ok if you forget). This helps distribute the salt. You will likely find that a liquid forms in the salt. You can continue to add salt if you wish until the liquid is eventually absorbed into the salt. Sprinkle it on anything you crazy heat lover. ENJOY!